In the course of my research on the more unknown schools, I want to introduce this time the Kaimoto smiths (甲斐本) of Bungo province. First of all, let´s address the name of the group. 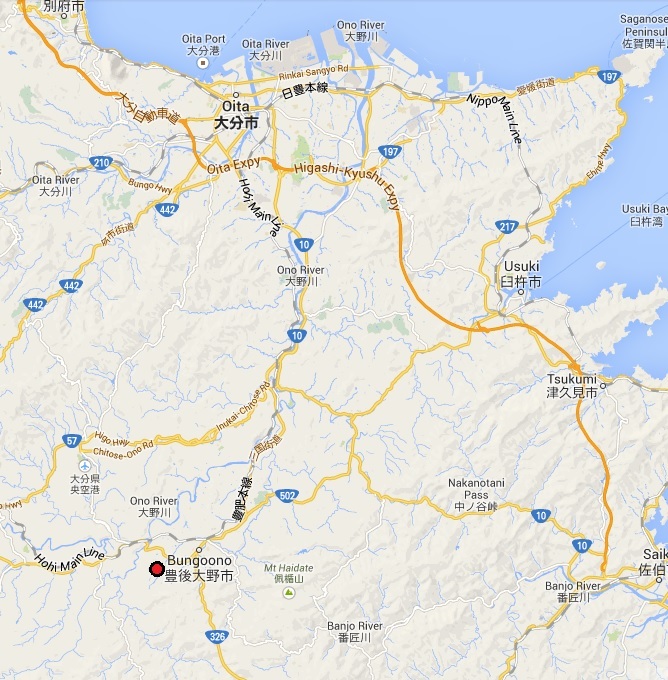 It goes back to an area of the same name in Nakao (中尾). Nakao in turn is located about 3 km to the southwest of the city of Bungo-Ôno (豊後大野市) and about 30 km to the south of the city of Ôita (大分市) and at the limits of the village of Nakao, there are still the graves of the Kaimoto smiths extant. The i in “Kaimoto” is usually not pronounced, i.e. with kay like in okay but with a longer “a” and not stressing the “y”. 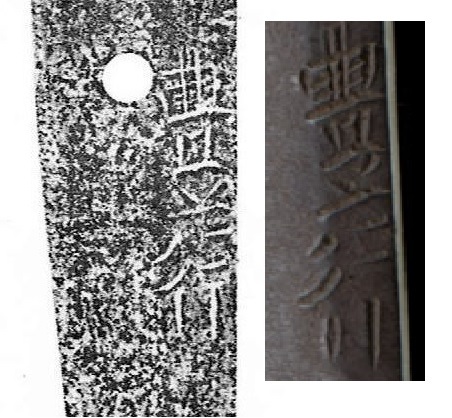 Older topographies transcribe the area also as “Kehinomoto” (ケヒノモト) and write the name with the characters (賀井本), or (賀井ノ本) respectively when the particle no was noted too. 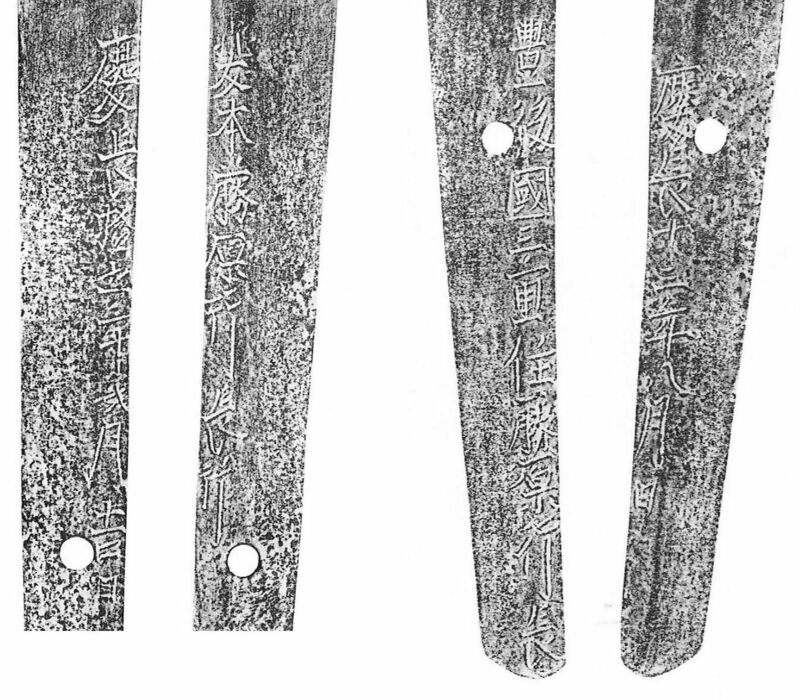 We don´t know exactly when smiths started to forge swords in the Kaimoto neighborhood but it is assumed that this was at the latest in the Sengoku period. The earliest written reference we have today is on a document with a joint signature of five magistrates (bugyô, 奉行) of the Ôtomo family (大友) from Eiroku five (永禄, 1562). From this document we learn that the Ôtomo provided the Kaimoto smiths from within Bungo´s Mie district (三重郷) with charcoal and iron and paid them a salary of 50 koku. Also we have genealogic informations on the group or rather family compiled by the 6th Kaimoto-generation Yukihisa (行久). Therein he states that the ancestor of the family was a certain Magoshirô Yukinaga (孫四郎行長) and the actual founder of the school his successor Matazaemon Yukinaga (又左衛門行長). Yukihisa states that the Kaimoto smiths were employed like the Takada smiths (高田) by the Ôtomo family and that they received initially a salary of 50 koku what matches with the bugyô document. But further he writes that when their lord Ôtomo Yoshishige (大友義鎮, 1530-1587), aka Sôrin (宗麟), retired and moved to Usuki Castle (臼杵城) in Tenshô four (1576), the salary was reduced to 10 koku. This is insofar interesting as it shows that the Kaimoto smiths played a more important role for the earlier Ôtomo campaigns, e.g. against the Kikuchi (菊池), Ryûzôji (龍造寺), and Môri (毛利) and until about the time Yoshishige was appointed shugo governor of Buzen and Chikuzen province and Kyûshû-tandai (九州探題) in Eiroku two (1559), compared to the later fightings against the Shimazu family (島津) and their fighting for Hideyoshi in the course of his Kyûshû Campaign in Tenshô 15 (1587). It surely also played a role that Yoshishige´s son Yoshimune (大友義統, 1558-1610) was accused by Hideyoshi in Bunroku two (文禄, 1593) of deserting under enemy fire in Korea and lost so all Bungo domains, a measure which basically sounded the bell for the end of the Ôtomo family. After Yoshimune was removed by Hideyoshi, the lands of Usuki, i.e. where Kaimoto was located, were given to his retainer Ôta Kazuyoshi (太田一吉, ?-1617). But Ôta sided with Ishida Mitsunari at Sekigahara and so his lands were again confiscated and transferred by Ieyasu to Inaba Sadamichi (稲葉貞通, 1546-1603) as he changed sides in favor of the Eastern Army during the battle. And the Inaba family held the Usuki fief (臼杵藩) until the abolition of the feudal system. Back to the Kaimoto smiths. We know from fief records from Keian four (慶安, 1651) that the Kaimoto smith Matazaemon (又左衛門) received still the salary of 10 koku and that the family was treated like with the same social status as that of a village head, whatever that means. It is assumed that this entry refers to the same sixth Kaimoto-generation Yukihisa who made the aforementioned copy of the families genealogy. So if this is correct than the meikan must be corrected because they date Yukihisa around Tenshô (天正, 1573-1592). Then we find an entry from Kyôhô eleven (享保, 1726) which states that the Kaimoto smith Sôzaemon (惣左衛門) is “doing a good job”, lit. “saiku mo yoroshiku tsukamatsuri-sôrô” (細工も宜く仕り候). But Kyôhô eleven seems too late for Kaimoto Toyoyuki (豊行) who was the one who bore the first name “Sôzaemon.” From another document we learn that the family was granted the status of o-memie (御目見), i.e. qualified to meet with the shôgun, in Hôreki nine (宝暦, 1759) what meant usually samurai status. But then for Kansei eleven (寛政, 1799) we read that the Kaimoto smith Ka´emon (嘉右衛門) couldn´t cope with the fief´s demands in him as a craftsman – lit. “shokubun-fushussei” (職分不出精) – and that so the status of o-memie was again withdrewn. After that time, i.e. entering the late Edo period, we loose track of the Kaimoto smiths. However, a document from the Usuki fief from Bunsei three (文政, 1820) in which several local merchants ask their government for the permission to have a bridge erected on their own costs mentions the name “Kaimoto Gensuke” (甲斐源助) as being as tea dealer (chaya, 茶屋) one of the petitioners. A nice wakizashi of Toyoyuki with some utsuri can be seen here. Picture 2: wakizashi, mei: “Toyoyuki” (豊行). Picture 3: Signature comparison of the two Toyoyuki wakizashi. So that was basically the history of the Kaimoto smiths and as a reference, I want to present a genealogy which bases largely on the information provided by Yukihisa but which was enlarged by other available data. But it must be mentioned that there is some confusion with the Bungo smiths, especially around the transition from kotô to shintô. For example there are several smiths from the Kaimoto and Takada group using the same name and in the meikan some shinshintô smiths pop up which are supposedly sons or students of the early shintô smiths. Also a question raises the naginata of the supposed 7th Kaimoto-generation Yukiie which is dated Kan´ei two (寛永, 1625) and which is today an important cultural object of Ôita City. To be more precise, when the 2nd Kaimoto-generation Yukinaga died in Jôô one (承応, 1652) as a transmission says, that how can the 7th generation be active at about the same time or even a bit earlier? The information provided by Ôita City says further that Yukiie, the maker of the naginata, was the son of Yukihisa what matches with the genealogy, but also that he was the younger brother of a Yukinaga. Apart from that, Yamada Masato (山田正任) presents in his 1974 publication Zusetsu Bungo-tô (図説豊後刀, p. 414) a blade signed “Bungo no Kuni Mie-jû Fujiwara Yukinaga” (豊後国三重住藤原行長) dated Keichô 13 (慶長, 1608). So one of the Yukinaga did not only sign with “Kaimoto-jû” but also with “Mie-jû”, i.e. with the district or larger area instead of the local neighborhood. Well, the naginata of Yukinaga which is signed with “Kaimoto” (without “jû”) and which is dated Keichô 16 (1611) presented by Yamada on page 349 seems to go back to a different Yukinaga, at least this is what the noticeable differences in signature style, in particular in the characters for “Yuki” (行), suggest (see pictures 4 and 5). Picture 4, signature comparison: Yukinaga naginata from 1611 left, Yukinaga katana from 1608 right. Picture 5: Line-up of the differing characters in question. My conclusion is that the Kaimoto genealogy provided by Yukihisa is sound as long as it is “enjoyed” by itself. As soon as we add data from outside, like for example extant date signatures and the genealogies of the Takada smiths, problems occur. I think that the Kaimoto smiths were surely working for the Ôtomo in late Muromachi times and that they were still pretty active in the Keichô era, i.e. right after Sekigahara. But with the establishment of the han system, the shifting of all major industries to the castle towns, and the general decreasing demand for swords, there was probably no longer much to do for a family of swordsmiths deep inside rural Bungo province. On the other hand, the chronicles of the Usuki fief still refer much later to certain Kaimoto smiths, so there must had been something going on. But maybe by then the Kaimoto smiths were already working from the fief´s capital, the coastal town of Usuki of the same name.